One Piece is widely recognized throughout Japan as the most popular manga currently available, which can easily be understood due to its compelling story line and well-written characters. The series has never stopped building momentum since its early days in 1997, and has now become a worldwide sensation selling more than 345 million volumes. And of course, with any popular franchise, the demand for licensed merchandise is never far behind. 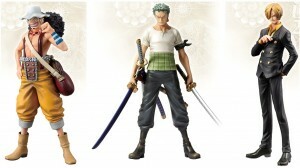 The most popular One Piece products to collect are the amazingly detailed character figures being produced in Japan. More than just toys, these scale replicas of Monkey D. Luffy, Zoro, Nami, and the rest of the Straw Hat Pirates are a One Piece collector’s dream. Currently, the three major companies producing collectibles are MegaHouse, Banpresto, and Bandai. The Portrait of Pirates figurines produced by MegaHouse are considered by many to be the highest quality One Piece collectibles on the market. Most are produced as 1/8 scale models and come with interchangeable accessories. Product lines produced by MegaHouse include Excellent Models, Neo DX (Deluxe), P.O.P Strong Edition, and P.O.P Sailing Again; each line offers different features with Neo DX being the highest quality collectible line produced by MegaHouse and P.O.P Strong Editions and P.O.P Sailing Again focusing on character realizations based on specific story arcs. If you are interested in a specific One Piece character, below are several links to help you in your search. On average slightly smaller than the P.O.P. figures, BanPresto’s One Piece DX series was initially created to be used as UFO catcher prizes. Because of the brand’s original purpose, auction sites usually show the unopened packaging box instead of the figurine. For a complete listing of what’s available at FROM JAPAN, click here or any of the One Piece DX links below. With the average figure size about the same as the One Piece DX line, these models are also known for their high quality craftsmanship and are a more affordable alternative to the P.O.P line. FROM JAPAN has a wide selection of Figuarts Zero collectibles available, which can be seen here, or check out a specific character using the links below.